Don’t you just love the added functionality and simplicity that comes with using a fire pit table, more so an outdoor gas fire pit table? Not only do you get to bring the indoors outdoors without all the usual hassles and dangers of a wood burning fire pit, but you also get to enjoy the warmth of a fire pit something that you will not get with an ordinary outdoor table. If your primary reason for owning a gas fire pit is to provide warmth then you might be familiar with the term BTU. BTU stands for British Thermal Units which simply a unit that measures the heat generated by a burner or you could say it is the heat value of fire pit fuels- Propane, natural gas or wood. Fire pits with the highest BTU rating are supposed to generate the most heat heat which is why BTU rating in a gas fire pit is so important. I will caution you though. A fire pit with a high BTU rating doesn’t not necessarily guarantee warmth. 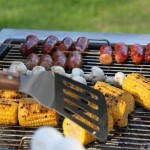 There are other factors that determine the heat output of your outdoor fire pit. More on this you can read HERE. But if anything, most outdoor gas fire pit tables are not really designed to keep you warm during those cold winter season but rather, they are designed to add flare, style and elegance to your outdoor living space in addition to give off some heat. 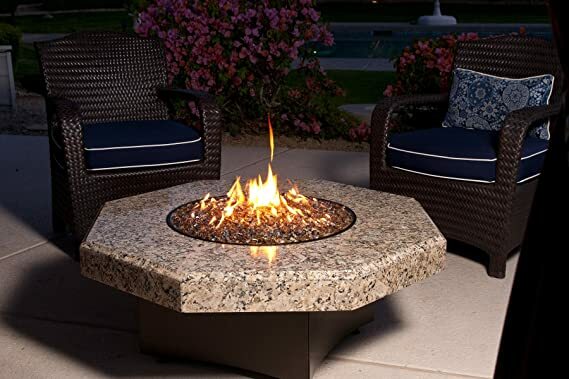 Outdoor gas fire pit tables are used to accessorize your outdoors and create a living space where friends and family can gather around which is what makes outdoor gas fire pit tables a popular alternative to ordinary outdoor tables. That being said, it doesn’t hurt to have as much heat as possible from your gas fire pit table which is why to some extent BTU rating in a gas fire pit is important. 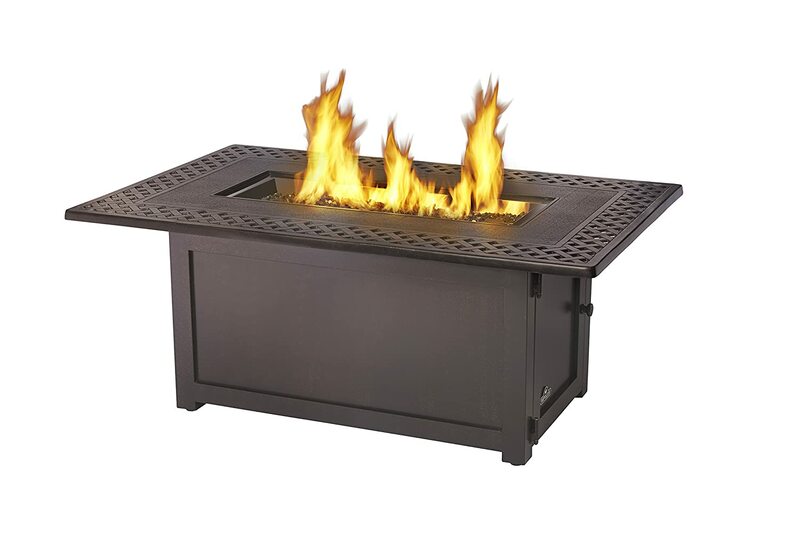 Because all things considered and holding all other factors like gas pressure constant, gas fire pit tables with the highest BTU ratings are supposed to be the warmest. 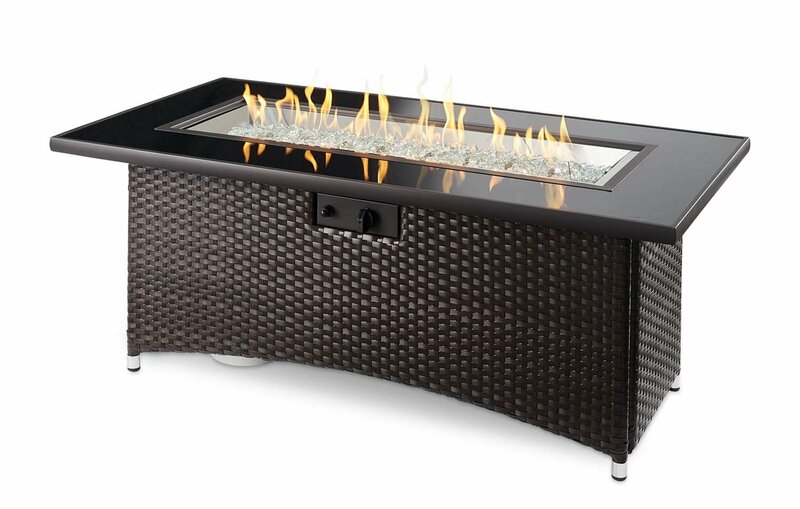 If the gas fire pit table is designed well and such things as gas pressure to the burner are okay, then your fire pit table should be able to generate enough heat to keep your warm during those chilly evenings. But not during winter. Never during the winter unless it’s a wood burning fire pit. But then I could be wrong. After doing a lot of research we have come up with this list of the best outdoor gas fire pit tables with a BTU rating of at least 55,000. If you’re looking for a cheaper fire pits or portable propane gas fire pits with high BTU, then this other list here will help you find what you’re looking for. These propane fire pit tables feature a durable powder coated steel frame. They have one of the highest BTU ratings for propane gas fire pits at 90,000 BTUs. This will ensure plenty of warmth and strong flames. They come with a 12-inch steel burner ring. 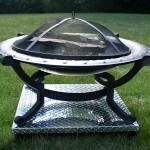 To access your propane tank the fire pit table tops are designed to be lifted off instead of a side door. Feature sturdy leveling feet to maintain stability on most patio surfaces. 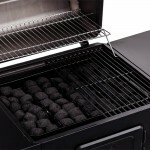 Include a burner cover for protecting the burner as well as to turn them into full tables. Also included is 40 pounds of fire pit lava rocks. Comes in either black Stucco Base with Black Supercast Concrete top or granite tile top and a Supercast top supported by an attractive double-pedestal stucco base. There is an optional tempered glass guard and burner cover available upon request. 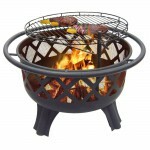 Elegance Oriflamme Outdoor Fire Pit Tropical Brown. All Oriflamme fire pits have a BTU rating of 60,000 and above. Up to 75,000 BTU heat output. 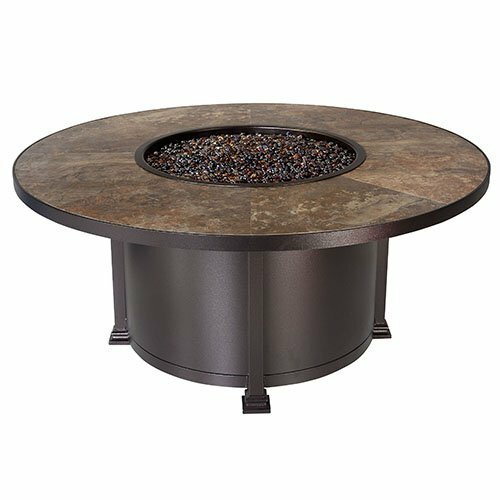 This outdoor fire pit gas table features a 42″ inch round granite top in tropical brown with a stainless Steel and a powder coated lid, ring, and base to prevent any rusting. High to low control knob on the side. Includes new dual tank system, lid, and fire pit glass. High Btu rating of 65,000. 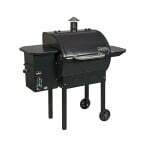 Features a tempered black glass top with a 12″x42 stainless steel burner and a balsam wicker base. Comes complete with a glass burner cover and glass fire gems. Includes hose and regulator, a gas valve, metal flex hose, a natural gas orifice and an electronic piezo. Can be converted to natural gas. Simple yet classic, these dining height Wine Barrel Fire Pit Tables would transform an outdoor living space into a stylish statement- making living area. 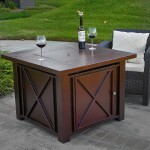 Using reclaimed wine barrels these creative fire pit tables are handcrafted in California.. 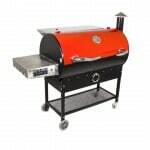 They feature a 19-inch 304 stainless steel burner with 65,000 BTU rating. The propane tank is housed at the base of the fire pit table accessible through an hinged door. They come with crystal amber fire pit glass and a protective weather cover. Natural gas conversion kit is available for purchase separately. Come in round, square or rectangular shapes. Features a cast from painted fiber-concrete and heavy gauge steel. 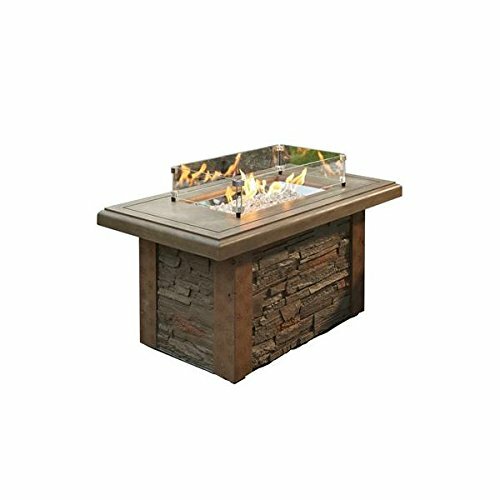 These gas fire pit tables come with a tank seat, glass panels, brown lava rock, electronic ignition,and a protective PVC cover. 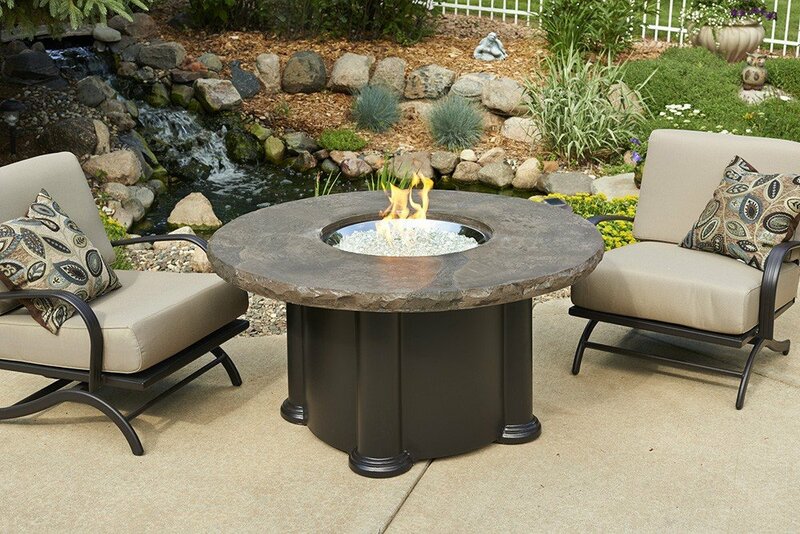 This unique Oriflamme fire table fire pit features a beautiful Giallo Fiorto granite tabletop with a beveled 4 inch edge a round matching powder coated metal lid. The frame is steel constructed with a high quality powder-coated finish for rust prevention. 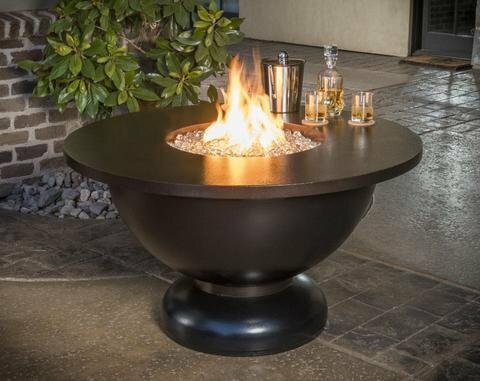 This Oriflamme fire table includes the elegance burner design which means it burns throughout the whole 22” diameter burner verses through just a small 6 inch ring. It features the dual tank system, which allows the fire table to hold 2 self contained hidden 20 lb standard tanks for double the burn time. 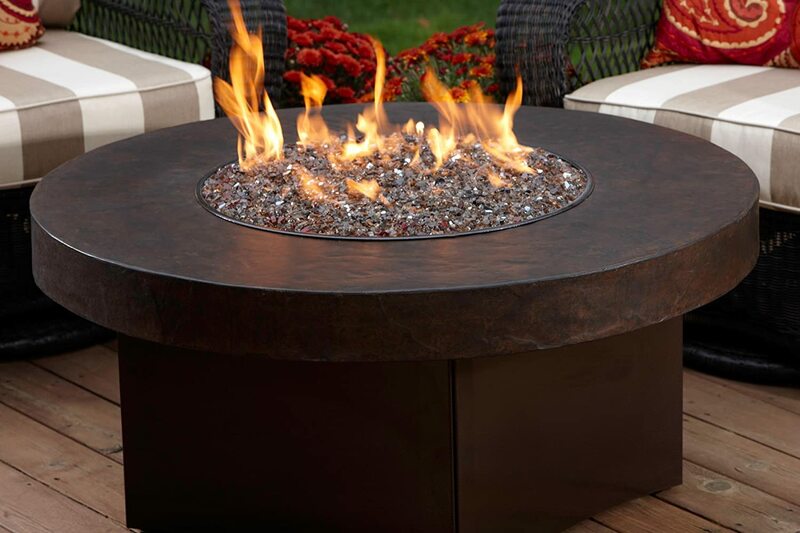 Includes Urban fire pit glass; A mixture of Copper, Black Reflective, and Gold Reflective fire glass and a a specialized tool for easily lifting the burner. This table has a high to low control knob on the side of the base that allows you to turn the heat up or down. Up to 65,000 BTUs with propane gas and up to 90,000 BTUs with natural gas. 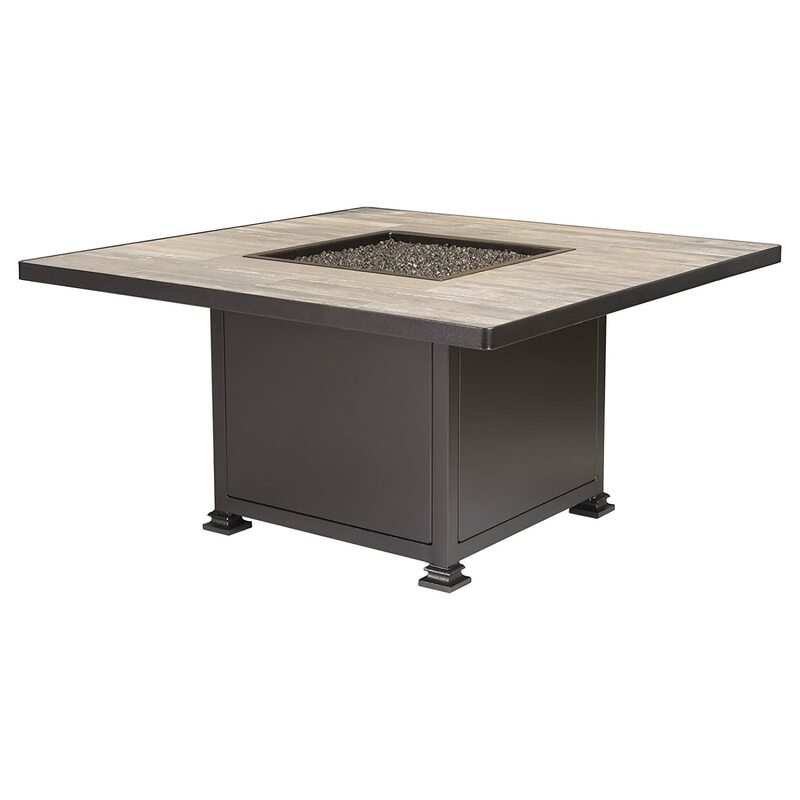 This outdoor propane fire pit table is made from an attractive Quartz-Concrete mixture and finished with a hand-troweled matte brown industrial look for increased durability. 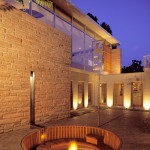 Included is a mixture of bronze reflective, copper and platinum fire glass. 21 3/4” in height which is the standard coffee table height. This table is easy to assemble. Up to 60,000 BTU heating output. Made of tough aluminum frame construction with a beautiful bronze frame finish. Features a safety shut off valve to prevent gas leakages when the flames are interrupted. 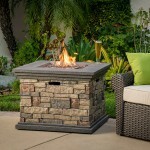 Features a super stone cast top and fiberglass base. Comes with 10 pounds of diamond colored fire gems; supercast burner Cover and push button igniter. Dimensions: 48 diam. x 25.25H inches. 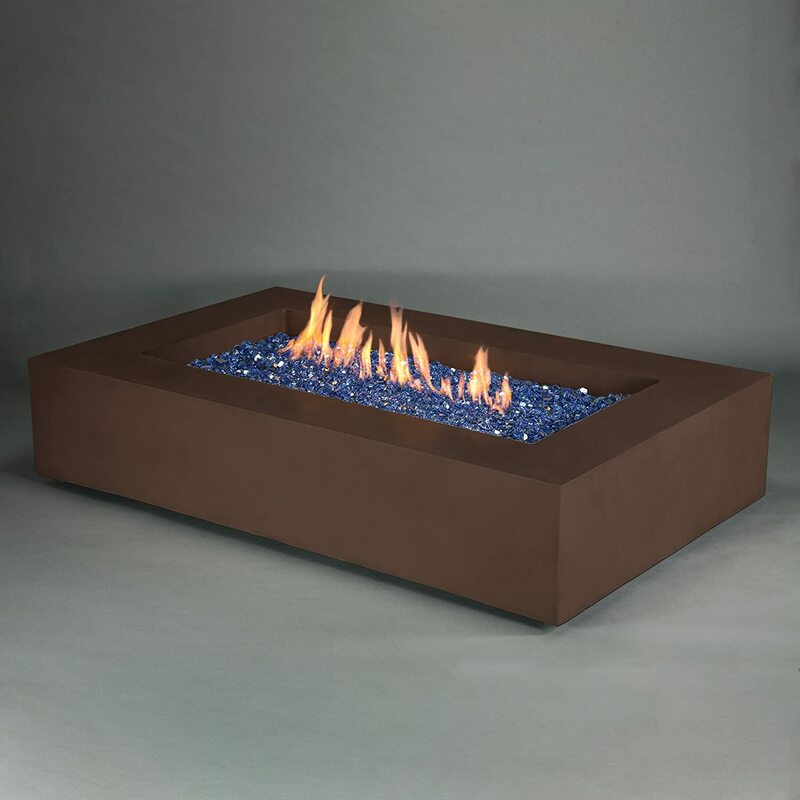 This gas fire pit table features a mocha supercast concrete top with brown Supercast and fiberglass base. Natural gas conversion kit included. 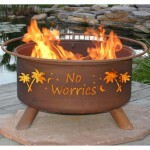 Includes 10 pounds of Diamond colored fire pit glass, Supercast burner cover and push button igniter. Round; 26 x 48 x 48 inches. Puts out 60,000 BTU’s of heat. It comes with a natural gas conversion kit. Comes in rectangular and square shapes. Napoleon’s St. Tropez patio fire pit table is handcrafted with aluminum which is durable and will not rust away. 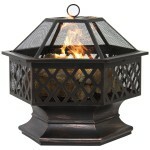 Aluminum flame has a rustic Bronze finish that gives an antique style. The fire table itself hides the propane tank behind an easy to access door. Has a thermocouple valve that is not only a safety feature, cutting off the gas when the flame is disrupted, but it also saves on propane, preventing gas leaks and wastage as soon as the flames are out. 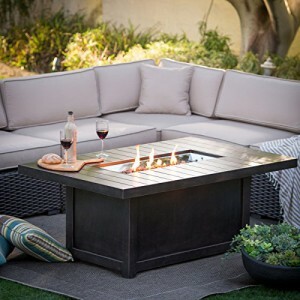 This outdoor gas fire pit table comes with drainage holes in the stainless steel burner that allow for water to drain out. 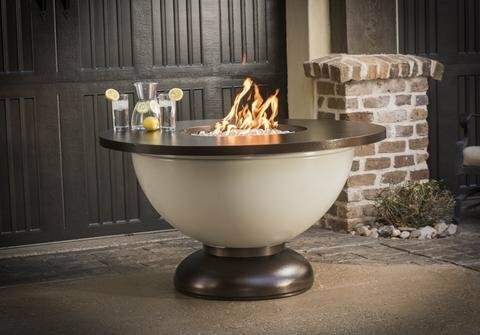 This Santorini fire pit table comes with a custom built 20″ round stainless steel burner and hearth top. Includes a slide out tank support for easy access. Comes with with Amber fire pit gems and a natural gas converter. 60,000 propane gas BTU heat rating. Iron fire pit frame with steel burner. Features a slide out panel for the tank for easy access. 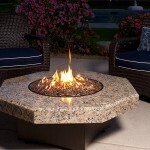 This fire pit table includes a natural gas conversion kit. 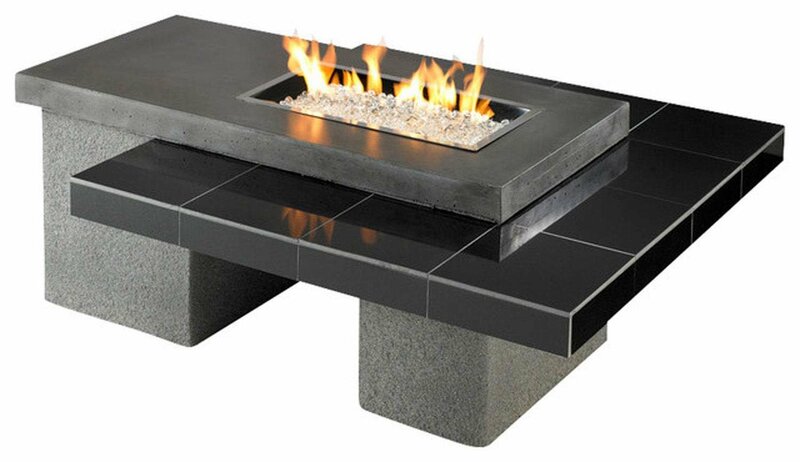 This unique design outdoor gas fire pit table features a granite supercast and outdoor-grade stucco finish with the stainless steel fire pit burner. 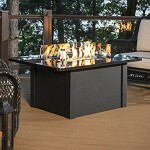 Includes diamond fire pit glass and burner cover. Comes with an electronic piezo for adjustable flame height. Heat output of 56,000 BTUs. Hidden enclosure for a standard propane tank. Can be converted to natural gas with the included adaptor. 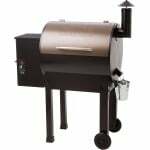 Includes a hose, regulator, gas valve, metal flex hose, natural gas orifice, and burner cover. 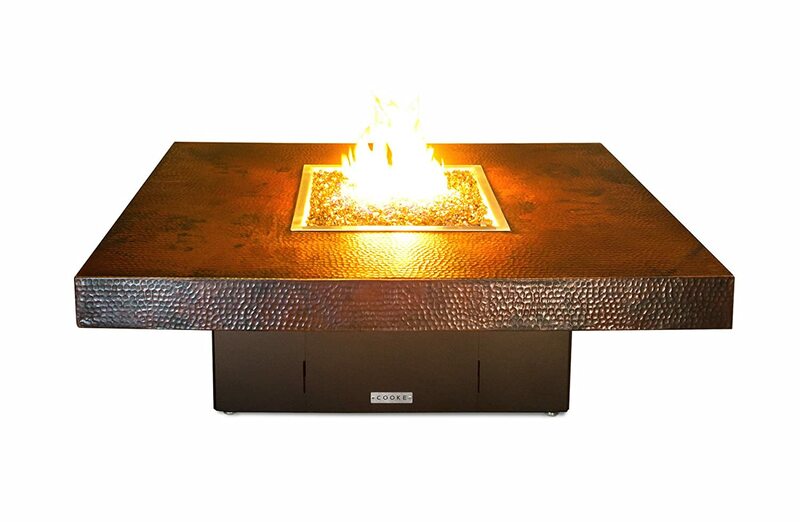 This Fire Pit table features an aluminum base and hammered copper top with stainless steel burner pan. The table comes with a door for hiding the special low propane tank (1 included) under the table. Also comes with bronze reflective glass, steel non whistling hose, optional safety thermocouple valve and steel pan cover. 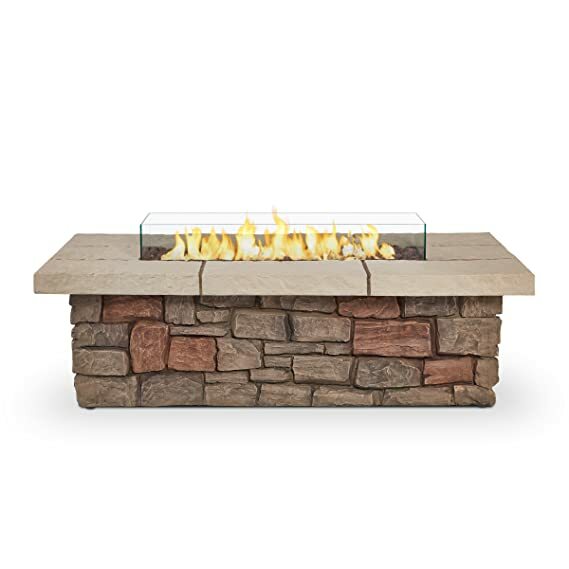 The 65″ Metro Rectangle Fire Pits come in a graphite finish or natural finish. 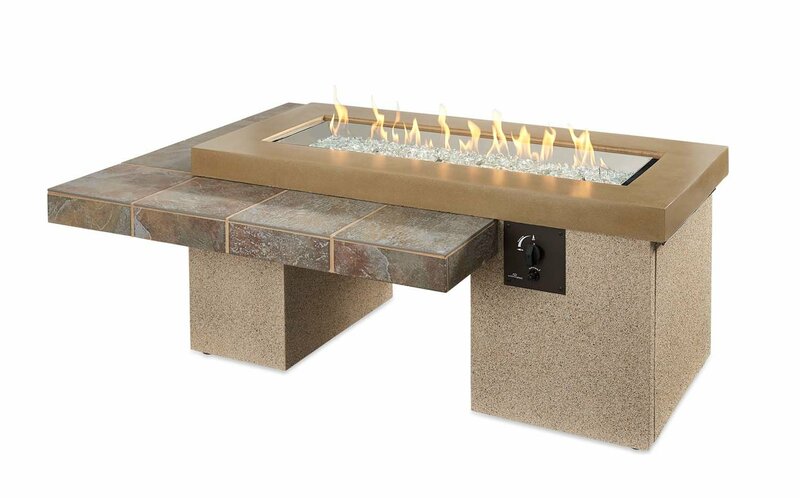 The Metro fire pit tables are constructed with polished durable composite concrete with a 304 stainless steel burner. These fire feature a pre-installed push button ignition system with flame control, and a control panel. Comes with a natural gas conversion kit and a stainless steel, height-adjustable articulating feet that allows for easy leveling. Comes with copper fire pit glass from Starfire Glass. 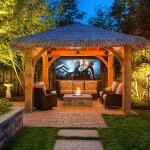 The perfect outdoor living space has to be a comfortable place to relax. 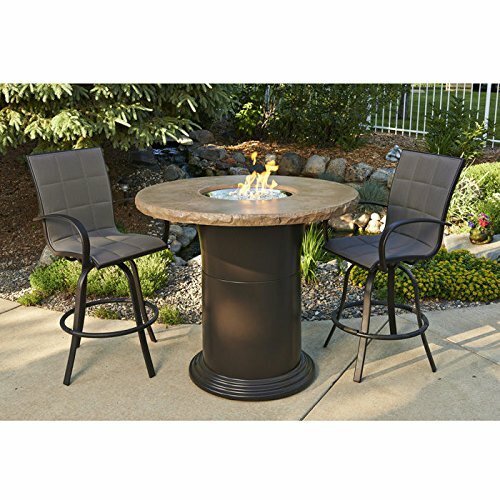 With a fire pit table you get an outdoor centerpiece where you get to set your drinks and snacks, gather around and keep warm. With these outdoor gas fire pit tables, not only are you assured of their functionality but also durability with years of service. Don’t go for an ordinary table while there are so many fire pit tables to suit your style and tastes. 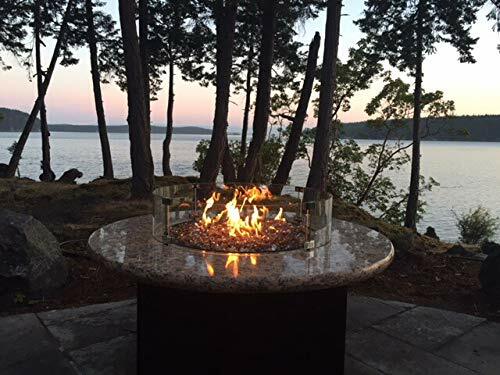 « Outdoor Portable Propane Fire Pits With High BTU Rating.